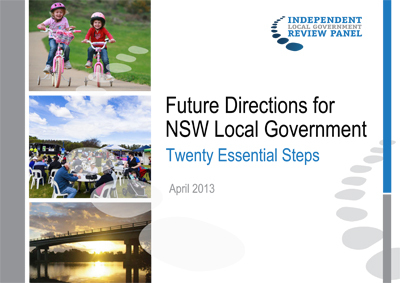 As strong supporters of local democracy, the Greens have been engaging solidly with the Independent Local Government Review, which is now in its third stage of consultation. Much of the public debate around local government for the past two years has centred on whether or not councils need to amalgamate – and there is obviously a strong push from the corporate sector and some quarters of the Liberal/National Party for forced council amalgamations. The Greens do not support forced amalgamations, we believe that local communities, not state governments, should decide how they are represented at a local level. In our submissions to date the Greens have presented evidence as to why council amalgamations are not some panacea for the difficulties facing local government. While we welcome that both the Local Government Review Panel and the government have to date committed to no forced amalgamations, they continue to strongly recommend amalgamations and have failed to address the arguments put forward by the Greens. The Greens welcome many of the Panel’s recommendations in relation to increased financial autonomy and sustainability for local councils, and in relation to formalising regional cooperation and making it easier for councils to work together. However, we are not supportive of recommendations which would centralise power in either the mayor or the general manager and create secretive ‘cabinets’ of councillors. One of the strengths of local government is the close connections and lines of accountability between councillors and the people they represent. You can read our full submission and see all our other submissions here.